South Africa. Beloved singer-songwriter and a true vagabond of ours times, Alice Phoebe Lou is coming back this March with her new album “Paper Castles”, a follow-up to her 2016 effort “Orbit“. Released a few weeks before the end of 2018, “Something Holy” is the first taste of this upcoming release. While the song itself has that “instant classic” aura, the video will keep you glued to the screen. You might also check out the official video for Alice’s duet with Olmo – “Devil’s Sweetheart”, which was another music highlight of the last year. Alice Phoebe Lou on Soundcloud, Facebook, Instagram, www. Angola. “Peit Ta Segura” is the first single from Aline Frazão’s fourth album “In the Rain”. Mixing up Atlantic vibes and European sound in such a fine way. The song, sung in Creole from Cape Verde, was composed by Danilo Lopes da Silva and, according to the artist, is “an old desire to sing in Creole. “My maternal grandfather is from Cape Verde and I have always seen the music of this country as one of my references”. “Peit Ta Segura” is a song of an essential beauty. It talks about this game of forces of nature that hold the sky, the sea and the tight hearts of this world. Aline Frazão on Facebook, Instagram, Twitter, www. Ghana. Last November finally saw the long-awaited 6-track debut EP of Ama Serwah Genfi a.k.a. Amaarae, which was aptly titled “Passionfruit Summers”. This young Ghanaian (partly US-raised) songwriter and vocalist with airy, sensual voice, and likes to pair it up with atmospheric R&B that’s as much about adding as subtraction sound-wise. Yet the thing that will strike you most in the beginning, is Amaarae’s creation in the official video for “Fluid”, directed by Fotombo and shot in Accra’s most colourful bathtub. Amaarae on Facebook, Twitter, Instagram, www. Tanzania. Whether you’ll find it the most fascinating or irritating albums of 2018, Bamba Pana recent record “Poaa” is an unforgettable experience. It was (successfully) brought to the world by one od Dar es Salaam’s chief producers. On this LP, Jumanne Ramadhani Zegge also re-defined what “repetitive” or “trance” really mean in music. “Baria” is a good first taste of Bamba Pana’s mix of local Singeli style combined with “hyper rhythms” and a healthy dose of parquet delirium. Bamba Pana on Facebook, Bandcamp. South Africa. The longest track on this list, it’s might also be the most hypnotizing ones, in that smooth style Black Montion’s brilliant two pairs of hands got us used to. The track features of Msaki, whose bright vocals add colours and some irregularities to the otherwise machine-driven track, and it shows Black Motion should actually think about becoming a trio. It’s one of those rare pieces that could as easily bring you out to the dancefloor – as put you to sleep. Black Motion on Facebook, Instagram, Twitter. Niger. For his fourth album, Tuareg blues virtuoso Omara Moctar celebrates his homeland and shares its pains. His fourth release, “Deran”, is a comeback to his homeland – both real and in Omar’s memories. Among the celebrations of bonds and Tuareg traditions, however, there’s also some pain of how conflicted the Sahel region has become. The title of the album was taken from the phrase “Deran deran alkeir”, which means “Best wishes, best wishes for peace”. Bombino on Facebook, Twitter, www. Nigeria. There’s a growing number of talented producers in Africa who update their local traditions with whatever computer can offer. Buba Barnabas a.k.a. Classiq is among those most original ones, combining hausa folk with hip-hop, the sounds of traditional instruments like xalam and kalangu with synths and auto-tune. There’s a whole new album he gave us last year titled “New North“, showing that past and present are quite okay to meet half-way. The song “Gargajiya” (“Culture”) is the one that cought us most and a great introduction to Buba Barnabas’ way of making his tradition survive – and augment – another century. ClassiQ on Facebook, Instagram, Spotify. Cape Verde. Now her homeland’s music ambassador, Elida had her first singing lessons in a church choir. When she started singing on her own, the challenges life had thrown at her found their way into emotional, honest approach. At the very end of 2018, this talented singer and composer returned with a new single and video “Anu Nobu”, one of her most dynamic songs, showcasing not just her incredible voice – but also your most powerful means to get even most stiff-necked people onto the dancefloor. Elida Almeida on Facebook, Twitter, Instagram, www. Mali/France. “Bonya” means “respect” in the Bambara language, and Fatoumata Diawara’s upbeat single is a plea to be considerate of one another. Combining electric bass, rocking beat and the subtle sound of kora, it mixes 1960s R&B and African tradition into a seamless and incredibly catchy whole. Among her many activities, Diawara managed to release her second solo album in 2018, seven years after her debut. Its filled with wonderful songs that showcase her impressive musical range, demonstrating that she’s still one of the most noteworthy voices in contemporary world music. Fatoumata Diawara on Facebook, Twitter, YouTube, Instagram, www. Senegal/UK. The London-based collective, now fronted by Senegalese singer and sabar player Kaw Secka, the afro-dance/afro-dub group Fofoulah released a new album “Daega Rek” just a few weeks ago on the wonderful Glitterbeat label. On this follow-up to their 2014 self-titled debut, they further step up their percussion/drum haze, while Secka’s vocal improvisations get even more unpredictable – and effective, if making you happily feel lost between the sounds and rhythms is the goal. Now they’re hitting the road again, so use your chance to see them live on stage, together with their original singer and dancer Batch Gueye. Fofoulah on Facebook, Twitter, www. Sudan. The beauty of Sudanese art, nature and its people as pictured by a young singer and songwriter Hiba Elgizouli and her sisters. “This is a zero budget project produced in Sudan with the support of young Sudanese artists and filmmakers” – says the description of Hiba Elgizouli’s latest video and seeing her sisters’ names in the credits seems to confirm it. Hiba is a young singer-songwriter originally from Omdurman, the second-largest city in Sudan has one of the most soulful voices we’ve heard recently with just the right amount of boldness and modesty. In “Rival”, she wanted to show the beauty of her country – its colors, nature, art, and pride. Hiba Elgizouli on Soundcloud, Facebook, Instagram, Twitter. Algeria. Imarhan are an acclaimed “desert blues” band from Southern Algeria, certainly one of the most talented groups in this geographic and stylistic territory. In 2018, they released their wonderful second album called “Temet“, which was accompanied by two singles – a short and dynamic “Ehad Wa Dagh“, recently followed up by a more sentimental “Alwa”. Not only both songs could appear in this list, but actually any of the ten tracks that appear on Imarhan’s new effort. The album’s title “Temet” means “Connections”, as it’s a “call for unity to the Tuareg community”. How about making this call global? Imarhan on Facebook, Twitter, YouTube, Bandcamp, www. Congo. Invigorating new video from one of the most colorful bands rooted in Congo, Lady Moon & The Eclipse. Lady Moon & The Eclipse is a multicultural collective based in Brooklyn and fronted by exquisite Congolese singer Ngonda Badila. In May, Lady Moon & The Eclipse came back with a joyful new single titled “Star Gazing,” which is an early taste of their upcoming new album called “Journey to the Cosmic Soul”. It’s accompanied by a restless video directed by Jonah Best, but each time we experience these intense five minutes we’re only wishing the full album was already here. Lady Moon & The Eclipse on Soundcloud, Facebook, Instagram, Twitter, www. Ethiopia / USA. It’s been almost two years since Ethio-American singer and composer Meklit Hadero released her last album “When The People Move, The Music Moves Too”, where she combined the atmosphere of her homeland with her experiences in Brooklyn and San Francisco. But she hardly lets us forget about that release, not just because of its lasting quality. Around the middle of the year, she released an expressive video for the track “Supernova” (on of her LP’s highlights), featuring a crew of dancers and directed by Pete Lee. “Where did you come from? / Where did you grow those bones?” she asks in the first lines. And then answers herself among the trumpets and hazy rhythm: “Everything we are was made in a supernova”. Meklit on Facebook, Twitter, Soundcloud, www. Kenya. This new video from Kenyan “urban folk” artist Kwame – it came out just a few weeks ago – might be his strangest yet. In a way, it sounds as if there was a demo track with incredibly rich vocals, and the proper arrangement was supposed to be recorded later. But it wasn’t, and that’s great. Because at a result we get this powerful mantra, which has the traditional rhythm and overall atmosphere, but sounds very contemporary because of all the layers and the R&B production of the vocals. Don’t keep this one in loop for too long. Kwame on Twitter, Facebook, Instagram. Kenya. Muthoni Drummer Queen (also known as MDQ) appeared in our Best of 2017 with her intense “Kenyan Message”, and now she’s back with something that only seems less engaged. While “Lover” does sound like a two-and-half minute party banger, lyrically it’s about a transgender woman proud about who she and celebrating it as hard as she can. It’s also another sample of MDQ’s upcoming album apparently titled “SHE”. Muthoni Drummer Queen on Soundcloud, Facebook, Twitter. South Africa. Johannesburg’s Nakhane Touré has been feeding us with great releases in the recent years, but 2018 brought his impressive full-length album “You Will Not Die” dedicated to his adolescent struggle with sexuality and church, all of that narrated with his unique, fragile but powerful vocals. Now 30 years old, he reflects on that time when he tried to “heal his homosexuality”, living in fear and constant self-control. While you should take your time and hear the whole story over the album’s 12-tracks, “Interloper” will give you an idea also with an impressive video by Mark Middlewick. Nakhane Touré on Twitter, Facebook, Instagram. South Africa. Behold the goddess – experience a delightful journey, listening to Nonku Phiri’s new single “Sîfó,” an ode to grief. It’s amazing how she succeeds to harmonize the human voice with the electric machine which blends with the beat. Her voice is an instrument that gives warmth and soul to the electro-melodies. ‘Sîfó’ is an ode to grief. The track encourages a discourse surrounding the necessity of embracing our vulnerability in a time of great loss and the importance of acknowledging the habitual defeats of not living with intention. So smart, beautiful, sad and strong. Nonku Phiri on Facebook, Instagram, Twitter. Congo/Angola/South Africa. The energetic and spiritual “Blame Fire” is an incisive reminder why Yannick Ilunga aka Petite Noir (half-Congolese, half-Angolan, based in South Africa), was hailed as one of the most promising new artists in electronic music. Released three years after his debut album, the song “Blame Fire” is part of the six-track EP, “La Maison Noir / The Black House.” Its aesthetics and message embody the essence what Ilunga calls “noirwave,” a pan-African cultural movement celebrating freedom and music. Petite Noir on Facebook, Bandcamp, Instagram, YouTube, Soundcloud, www. Zambia/Botswana/Australia. A passionate celebration of feminity, “Energy” is Sampa Tembo’s latest single, heralding her first full-length album, to be released sometime next year. Musically, the song continues where her astonishing mixtape, “Birds and the BEE9,” left off, sporting a very organic sound with soft beats, brass parts and soulful background vocals. This style has turned Tembo into one of the most interesting new voices in contemporary hip hop, and, if the song is anything to go by, the album should only confirm her incredible musical capabilities. Sampa the Great on: Facebook, Twitter, Soundcloud, YouTube, Instagram, www. South Africa. Skai Lounge is one of the few local artists from South Africa who produce dreamy music, but it ain’t just music… this is an experiment and tranquil internal experience. “D.M.C is literally about some of the deep conversions I’ve had with friends and strangers, plus learning how to genuinely connect with fellow human beings,” says Skai Lounge. Carefully composed, wavy basslines are complimented by ambient vocals and a coercive downtempo rhythm. The whole thing has a beautiful and unexpected tenderness attached to it. South Africa. After a successful start in 2017, Sun-EL Musician followed up with a full-length album called “Africa To The World“, with some incredible tracks – and guests. “Sonini” is one of the highlights, featuring Simmy and Lelo Kamau as well as a train-steady dancefloor beat that will keep you glued to the speaker from the first bar and wishing the song was at least twice longer. Perfect (yet risky) track to drive to! Sun-EL Musician on Facebook, Twitter, Instagram. Niger. On their third international release, “Tantabara,” the celebrated ensemble from West Africa do what they do best. Combining raw guitar sound, complex trance-inducing rhythms, and poppy melodies sung by eight different vocalists, Tal National’s music enthralls with it limitless energy and lively vibe. The single “Akosas” is a perfect example. Tal National on Facebook, Bandcamp, Instagram, www. 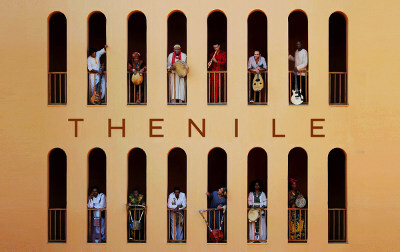 There ain’t so many initiatives like The Nile Project in the world, where so many talented musicians from so many countries get together to do something good – and it’s not just about good music, but also also is about good music (and that’s actually rare, isn’t it). Musicians from the Nile countries have been getting together for many years now, and “Tana” is the third album of this ever-changing collective. It might also be their most consistent, feeling like they indeed were a band. The album came us at the very end of 2018 and you could take out any single song from it for this list, but we’re especially fond of the opening 8-minute chant “Fulani“. The Nile Project on Facebook, Twitter, Instagram, www. Congo. After a restless debut EP released last year, French-Congolese project TSHEGUE is back with as intense video shot in the Ivory Coast. The project is fronted by Faty Sy Savanet, who was born in D.R. Congo’s capital Kinshasa, but spent most of her life in Paris – but clearly with an outlook to the rhythms and sounds of Africa. In TSHEGUE, she’s accompanied by French-Cuban producer Nicolas Dacunha, who’ve added another hemisphere of inspirations. Ghana. Yeah, we fell in love Kendrick Lamar years ago as well. Now listening to the young Accra-based rapper Worlasi – you might already know him from our Best of 2016 – following his effortless and adamant flow, and knowing that his artistis mission is to “empower the youth through music” – it reminds us of something. And that’s a association. That Lamar track closed his breakthrough mixtape “Section 80”, and similarly “BoozeHigh” is the last track on Worlasi’s first still most-recent release “Outerlane“, now accompanied with a great animated video by Peter Poka. Dare we say that Worlasi might be even better than Lamar at this point of his career? Worlasi on Soundcloud, Facebook, Twitter, Instagram.